Green Firewood - Should You Burn It? Green firewood is any wood that has a high moisture content and is not seasoned. The tree species does not determine whether or not the wood is green, it's the moisture content which is affected by how long the tree has been cut up, split and dried. If you have ever used green firewood you know it can be very frustrating. The moisture in the wood makes it hard to light and hard to burn. Green wood will sizzle, pop, smolder and smoke. It's nearly impossible to create a hot fire with the wet wood because it never really takes off or gets going. All of the energy and heat produced by the fire is used to evaporate the water from the wood. This is what creates the sizzling sound you hear when the wood is in the fire. Besides being frustrating to burn, green wood can be more dangerous than firewood that's been properly seasoned. Green wood can cause creosote to build up on the inside of your chimney leading to a potential chimney fire. Creosote is a flammable substance left behind from using unseasoned firewood. As unburnt gasses from a cool fire go up the chimney they adhere to the chimney wall. 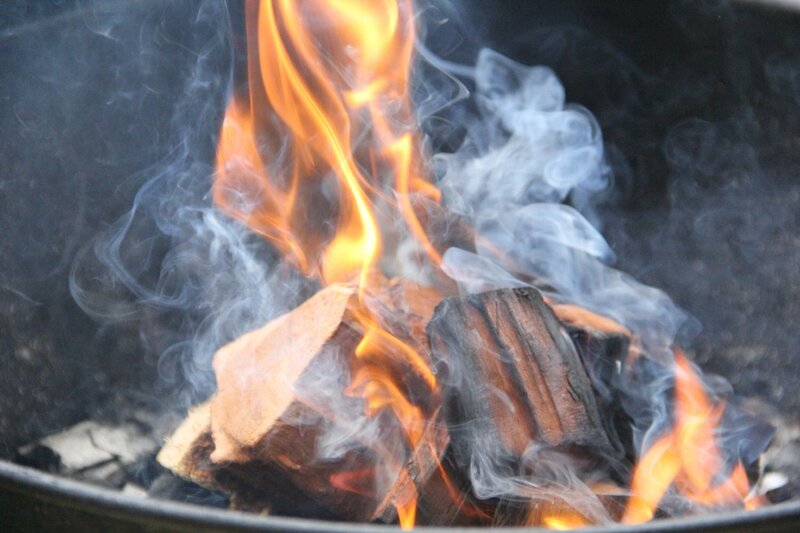 Using well seasoned wood creates a hot fire, reducing creosote buildup. Green wood will generally look fresh. The bark will still be firmly attached to the wood and it will feel heavy. The ends of the wood where it has been cut may feel damp and it will have a light color. Seasoned firewood will feel lighter. The outside of the wood will be dark and grey and the ends of the logs will be cracked. The bark will be flaking off or missing all together. When you burn firewood, this old grey wood is what you want to look for. Seasoned firewood should be easier to light, burn hotter and last longer than green wood. To season green wood it should be split and stacked in a dry place where it can properly dry. This may take around one year depending on the species of wood. Softwoods like pine or fur will dry out and season quicker than a dense hardwood like oak. Oak may take a minimum of one year if not longer to properly season. If your serious about heating with wood, think one year ahead. The firewood you cut this year should be next years wood. Avoiding green wood and planning ahead can save a lot of trouble and keep you safer in the process.